A new edition of the #1 text in the Human Computer Interaction field! Hugely popular with students and professionals alike, Interaction Design is an ideal resource for learning the interdisciplinary skills needed for interaction design, human–computer interaction, information design, web design and ubiquitous computing. This text offers a cross-disciplinary, practical and process-oriented introduction to the field, showing not just what principles ought to apply to interaction design, but crucially how they can be applied. id-book.com, the accompanying website, contains extensive additional teaching and learning material including slides for each chapter, comments on chapter activities and a number of in-depth case studies written by researchers and designers. Jennifer Preece is Professor and Dean in the College of Information Studies, Maryland's iSchool – at the University of Maryland. Yvonne Rogers is the Director of the Interaction Center at University College London as well as a Professor of Interaction Design. Helen Sharp is Professor of Software Engineering and Associate Dean at the Open University. A cross-disciplinary, practical and process-oriented approach to the subject, showing not just what principles ought to apply to interaction design, but crucially how they can be applied. 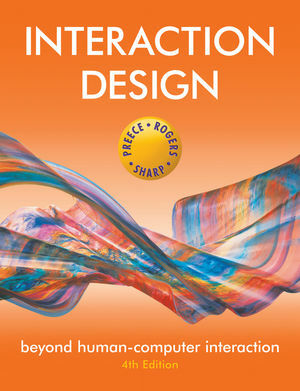 Focuses on how to design interactive products that enhance and extend the way people communicate, interact and work. Includes motivating examples illustrating both technical, but also social and ethical issues, making the book both accessible and adaptable for computer science and non-computer science users. Features interviews with key HCI luminaries and provides an insight into current and future trends.